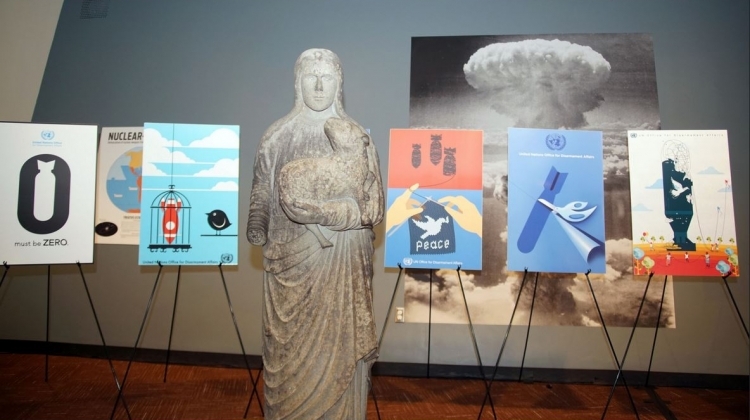 On 3 May 2016, the United Nations Office for Disarmament Affairs (UNODA) organized an event to showcase the twelve winning posters from eleven artists who won the United Nations Poster for Peace Contest. 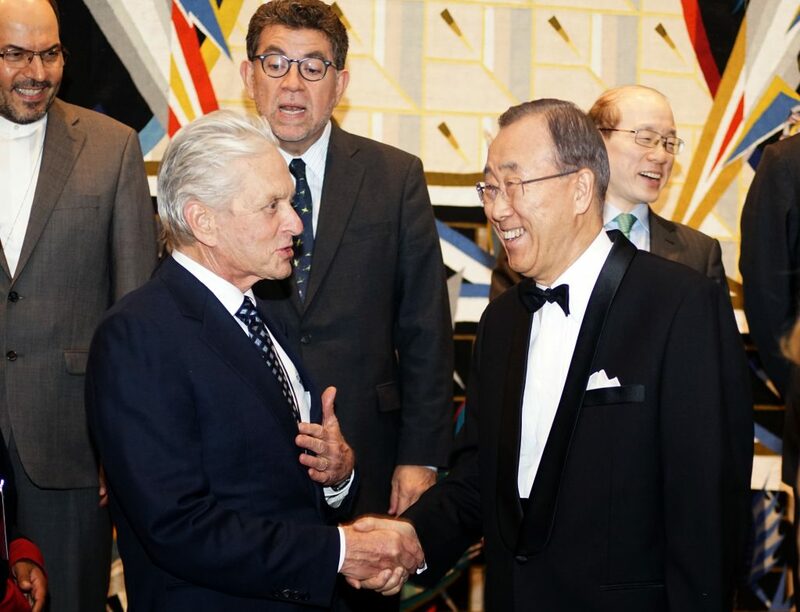 Secretary-General Ban Ki-moon, President of the General Assembly Mogens Lykketoft, High Representative for Disarmament Affairs Kim Won-soo and United Nations Messenger of Peace Michael Douglas participated. Honoured guests were first prize winner Ivan Ciro Palomino Huamani and third prize winner Anjali Chandrashekar. The contest was held to commemorate the seventieth anniversary of the first United Nations General Assembly resolution, which established the goal of eliminating atomic weapons and all other weapons adaptable to mass destruction. More than 4,000 works of art were submitted from 123 countries. 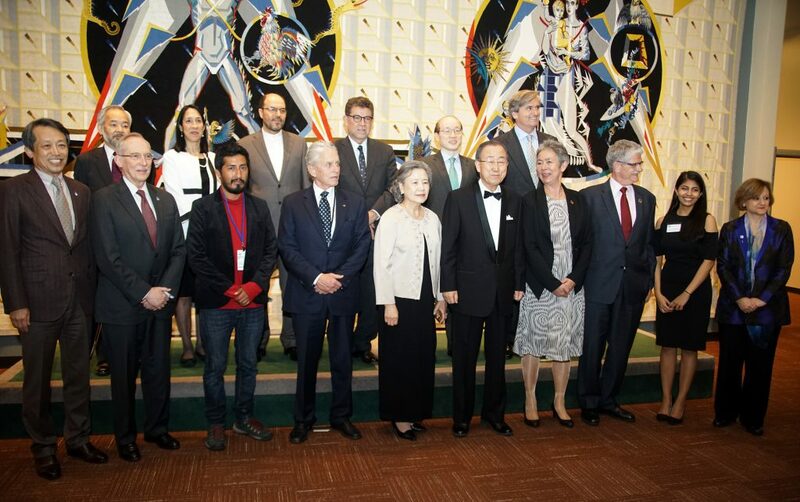 Secretary-General Ban stated during the event that “this competition is a wonderful celebration of creativity, but it has an important purpose: to reaffirm the United Nations’ historic commitment to nuclear disarmament”. He noted that he was especially pleased to hear that young people were strongly represented in the competition. 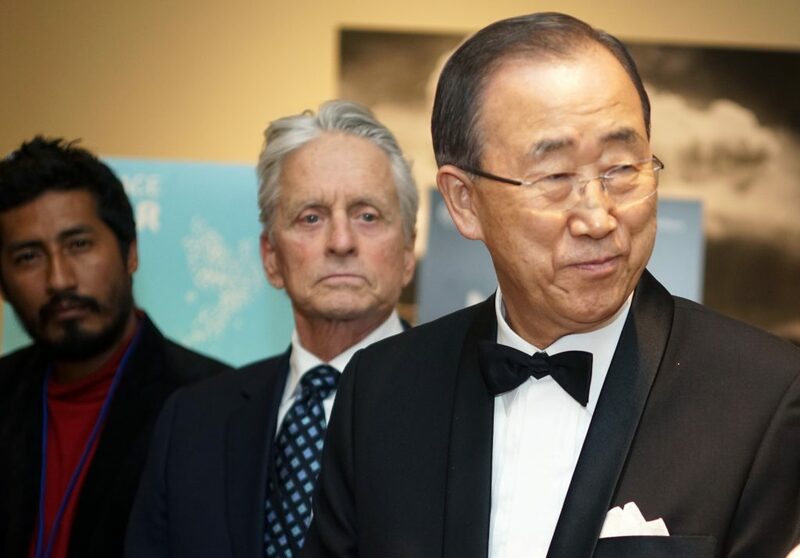 “Young people did not create nuclear weapons, but it may be their task to eliminate them once and for all”, he added. 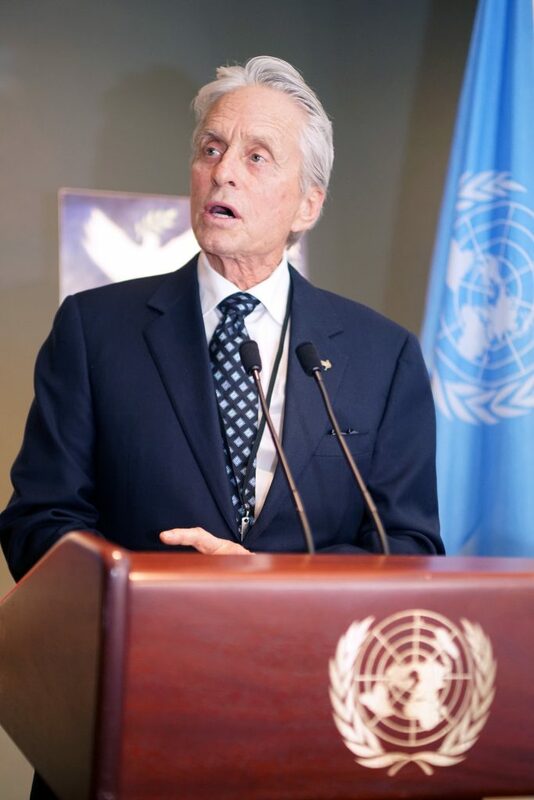 UN Messenger of Peace Michael Douglas said that the UN Poster for Peace contest is meant to raise awareness for the need for nuclear disarmament and to inspire citizens across the globe to use their artistic talents to promote a world free of nuclear weapons. He stated that in order to accelerate all current endeavors and to create momentum for nuclear disarmament, creativity is essential. In referring to a famous quote, Mr. Douglas said, “Art is not a thing, but a way. 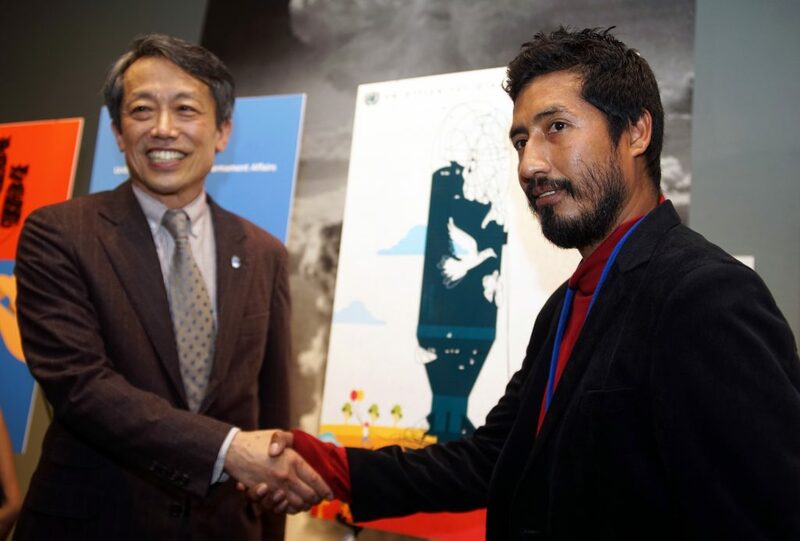 These works of art help point the way to a nuclear-weapon-free world.” First place went to Spinning Peace by Ivan Ciro Palomino Huamani from Peru, who received $3,000. Mr. Huamani is an artist based in Lima, Peru and is passionate about design, illustrations and infographics. The $2,000 second-place winner was Michelle Li from the United States for Peace in Our Hands. Ms. Li, who joined the event with a video message, is a 15-year old high school student from California who loves to draw. 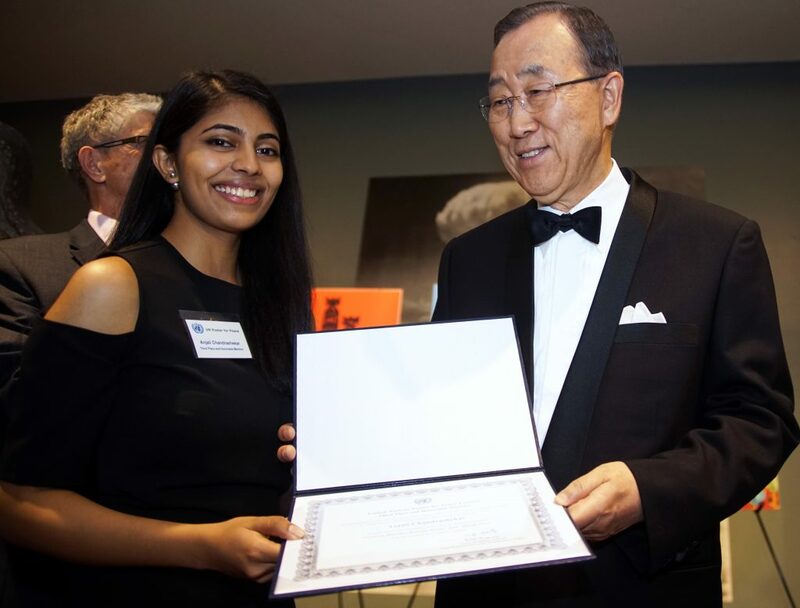 Third place, with an award of $1,000, recognized Anjali Chandrashekar for Cutting Barriers through Peace. Ms. Chandrashekar also received an honourable mention for another poster entry titled Break Free. She is based in New York City and has been working in design, tech and social innovation, through which she envisions influencing change and impacting people’s lives. The other honourable mentions were: Who is the Bird Now? by Nadia Anthouli from Greece; The Red Beak by Jorge Malo from Spain; Change for Peace by Kazem Bokaei from Iran; War and Peace by Jixin Wang from China; Bomb of Peace by Sylwia Kuran from the United Kingdom; Love Peace No War by Lijang Sun from China; Must Be Zero by Kumi Nakazato from Japan; and Clear Nuclear Weapons from the World by Roberto Losada Maestre from Spain. Each of these artists received a cash prize in the amount of $250. 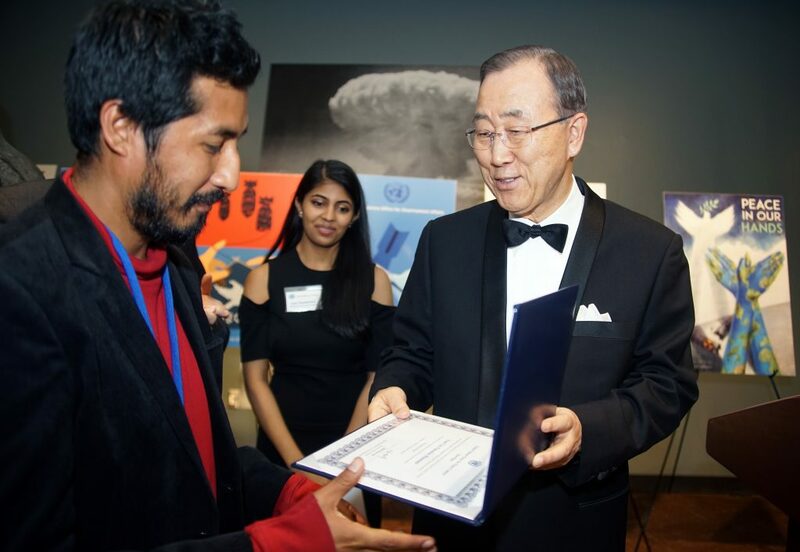 All winning artwork will be used to support the United Nations message on the importance of nuclear disarmament and will be presented in various platforms including exhibits, banners, postcards and calendars. The winning posters can be seen at www.unposterforpeace.org.